Flowers must have been our most intense source of the experience of colour for most of human history. Through the Middle Ages, cloth and buildings were drab. Stained-glass windows were intense visions. And then there were flowers. The richness of Dutch flower painting burst out from a delight in the depiction of impossibly sumptuous explosions of colour - vases piled high with paradisal flower presences, all seasons impossibly together, many of the flowers worth more in the market than the masterpieces that depicted them. Dutch and Flemish artists recorded in their still life paintings more than just a pleasing arrangement of objects for viewing. These works combined the tradition of the symbolic use of plants and animals, together with an interest in the sciences and the acquisition and display of rare and luxurious goods. Albrecht Dürer's paintings of growing plants - specimens of grasses, cowslips, heartsease - give an intense visionary pleasure, simply because of the accuracy with which he recorded the crowding shape of the leaves, the exact yellowing stain of incipient decay. He saw the accidents of a particular plant and managed to make them into the essence of beauty as a process. "How with this rage shall beauty hold a plea/ Whose action is no stronger than a flower?" Flowers are tough, as well as fragile, and humans care about the relations between humans and flowers. Plants remind us of who we are, and what we have to lose. Like many people, I first met the idea of this kind of inner eye in Wordsworth's Daffodils, where he summoned up the golden brightness upon "that inward eye/ Which is the bliss of solitude". Blake said: "I can look at a knot in a piece of wood until I am frightened at it". A reminder of DH Lawrence's "big and dark" Bavarian gentians, "burning dark blue,/ giving off darkness, blue darkness", blue torches leading into the dark. Observation and creativity are cornerstones of advancement in science but these often pass unnoticed when students hurry past, obsessed with the two other cornerstones-control and measurement. We have only to look at Japanese prints of flowers, to see something of the attentive creative care with which the Japanese artists isolated the essential forms of a peony, or an iris. What we contemplate is the brilliance of the relation of the work of the hand to what the eye sees. Manet's white peonies are swirls of gleaming white, and grey shadows and gold stains, and are delightful almost as abstract paintings. This is a thought about what light does to paint, with the surfaces of the flowers represented primarily as the impulse to paint. A study of flower paintings must always bring one up against Georgia O'Keeffe, with her infolded sexual flower-flesh, her enveloping petals, and her quivering stamens. Art is always a reflection of the hidden design of universe. It by nature is a reflection of light, order, beauty, mystery, meaning, cohesiveness, oneness, and organic, joyful wonder. To the extent that we have the inner Eye of wisdom to see, art becomes a lens through which we know ever more clearly, aspects of spirituality, within and without. The origins of 17th century still life can be found in European miniature painting of the late 15th and early 16th centuries, in which artists made intricate illustrations for prayer books and took great care to make the images appropriate in quality to these religious books. Increasingly, the artists paid attention to decorative details of flowers and animals used as symbols of spiritual ideas. Emblem books are another tradition of illustration where animals and plants were used symbolically. These contained poems dealing with moral and philosophical issues, often rooted in medieval spiritualism. The imagery found in the paintings on display can be interpreted using traditional medieval symbolic meanings. The caterpillar and butterfly represented life and rebirth; the bee, a social animal, indicated diligence and hard work. Based upon ancient Greek ideas of the four elements, the salamander, popular in medieval bestiaries, represented the element Fire; the frog represented Water; flying insects such as dragonflies and butterflies represented Air; the fruit and flowers represented Earth. Usually, the artists used a mix of flowers from the different seasons, and other objects to evoke the five senses, in order to convey the idea of the passage of time, and eventual decay. The four distinct stages in the life cycle of insects-egg, larva, pupa and adult-symbolized inevitable change and the passage of time. Flowers point to the briefness of beauty and are the essence of spirituality, which is a distinctly human trait whereby we yearn to belong to something greater than the self. We desire to inquire the source/nature of life and death, address humanity's most profound needs and concerns, acknowledge intangible forces in universe. Botany is in an excellent position to reflect on all this. How can we structure such a joint on-going reflection of the two-way interaction between the making of gardens and the painting of them? Charles H. Smith's note entitled: 'An aggressive book review of Grant Allen's The Colour Sense: Its Origin and Development, printed in the Nature issue of 3 April 1879 provided the following condensed formula for this interaction. "Insects produce flowers. Flowers produce the colour-sense in insects. The colour-sense produces a taste for colour. The taste for colour produces butterflies and brilliant beetles. Birds and mammals produce fruits. Fruits produce a taste for colour in birds and mammals. The taste for colour produces the external hues of humming-birds, parrots, and monkeys. Man's frugivorous ancestry produces in him a similar taste; and that taste produces the final result of human chromatic arts." Interpreting ourselves through colour and carrying that into the garden takes some management and a few simple strategies. Judith Evans' first piece of advice is: forget the colour wheel and traditional theories of hue compatibility. Most colours and all their shades fall into three groups-warm, cool and neutral. So let's start with the neutral tones, which, despite their calm demeanour, are key players in all colour expression. The idea of a painterly approach to gardening was the colour-controlled border, which was first developed in the 1890s by Gertrude Jekyll. Her idea was to use cool colours on the ends of the border and rise to a crescendo of hotter ones at the centre. Although she planted many single-hue gardens, Gertrude Jekyll understood this. "It is a curious thing," she said, "that people will sometimes spoil some garden project for the sake of a word.... A blue garden may be hungering for a group of white lilies, but is not allowed to have it because there must be no flowers in it but blue flowers. I can see no sense in this; it seems to me like fetters foolishly self-imposed." At the Central School of Design in Kensington, where she enrolled in 1861, as one of the first female students, to study painting, Gertrude Jekyll attended lectures by John Ruskin (Slade Professor of Art at Oxford), Ruskin's pupil William Morris (who also founded his firm of Morris Marshall and Faulkner in Bloomsbury in 1861), and Richard Dresser (a Fellow of the Linnaean Society and an authority on decorative arts). Jekyll also had lectures from the Principal of the School, Richard Redgrave, on the scientific principles underlying harmony in the composition of colours developed by Michel-Eugene Chevreuil (head of the dyeing department at the Royal Gobelins tapestry works in Paris). Ruskin was a great advocate of the paintings of JMW Turner, whom he considered to be the greatest English painter, so Gertrude Jekyll was encouraged to study Turner's paintings. The drama of his subject material and, in particular, his use of colour to highlight that drama, had a profound influence on Miss Jekyll's art in general and on her garden design in particular, focusing her attention especially on the use of flower colour in planting design. Through a mutual friend Gertrude Jekyll met Claude Monet in the early days of his garden at Giverny. Their passions for gardening and painting and their concerns about light and colour were similar. Monet's were recorded for posterity in his paintings and are visible in the restored garden at Giverny. There beginning in 1890, the painter created a garden in which colour was as carefully controlled as it was in those of Gertrude Jekyll. Monet, who like Jekyll was nearly blind in his old age, was an avid gardener. His flower borders consisted of loose rhythmic bands of colour that became the subjects of his remarkable late paintings directly recorded the gardens as he saw them, painting in the open air. The painter declared that he was "striving to render his impressions in the face of the most fugitive effects." Thus, he painted what he observed: objects which transformed light into colour as it resulted from the play of light. Jekyll also developed the concept of garden rooms and the one-colour garden, but it was Beatrix Farrand in the United States (Dumbarton Oaks) and Vita Sackville-West in England (Sissinghurst)who made them famous. Ferrand was the niece of renowned American novelist and garden historian Edith Wharton. Through the creation of the gardens at Dumbarton Oaks, Beatrix Farrand exhibited a distinctive American adaptation of a Mediterranean garden form. Farrand was closely aligned with the English Gardening Movement and Gertrude Jekyll's planting designs. Furthermore, one of the key points of Farrand's originality was in her use of plants. 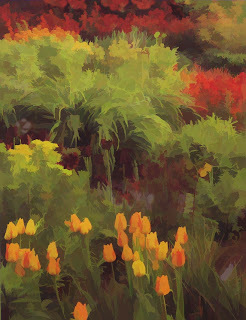 In part by their providing colour, texture, and depth, she specified the actual plants to be strong design elements in and of themselves, taking the view that in setting a garden she was painting a picture? Sissinghurst's garden was created by Harold Nicholson and his wife Vita Sackville-West in the 1930s. Although the Sissinghurst property was derelict, they purchased the ruins and the farm around it and began constructing the garden we know today. 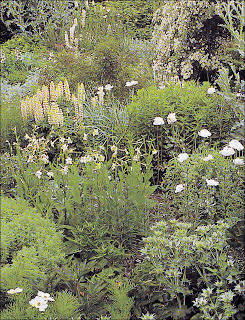 The layout by Nicholson and planting by his wife were both strongly influenced by the gardens of Gertrude Jekyll. Vita Sackville-West's passion for plants was shaped by her love of old Dutch flower paintings and by the choice of species she saw on her travels in Europe and the Middle East. The romantic associations of flowers with the past, painters and faraway countries were to influence her choice of planting as Sissinghurst developed. The influence of the floral arrangements of the Dutch masters is evident in the abundance and romance of an unstructured tumble of flowers, relying little on form and foliage. Structure was given to the garden by the arrangement of a series of 'garden rooms' created as spaces for the painterly arrays of bedded flowers contained by walls and hedges. There are actually 10 gardens, separated by hedges, arches, and moss-covered walls draped with climbing roses. Each one is unique and secluded. 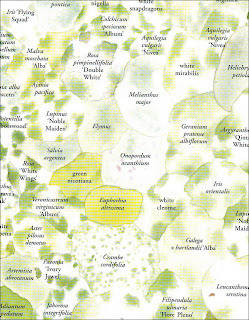 Sissinghurst has been a major influence on late 20th and early 21st century garden design. It is a model of the use of plants to create living canvases of colour, which are abstract arrangements not far removed from the creation of the abstract expressionists such as the American Hans Hoffman. Abstract painting and the colour controlled bed of flowering plants both deal with the problem of the synchronised development of both form and colour. In its final state the colour development over the whole canvas or bed leads to the creation of colour, or light, complexes. The aim of their makers is to create a total pictorial totality with no fragmentation of colour or texture.